Within a few months of its launch, a new Emory policy that aims to significantly increase the amount of campus waste being diverted from area landfills is already making an impact. Introduced in January, the new Campus Waste Management Policy seeks to divert 95 percent of waste from municipal landfills by 2025 — effectively a zero waste policy — through a targeted strategy that includes standardized and expanded recycling bins and widespread community engagement. And based upon recycling data collected by Emory’s Division of Campus Services, it’s working. Comparing landfill diversion rates for Emory’s total waste stream from March 2017 to March 2018, diversion of campus waste increased by an additional 94 tons over last year. Examining year-to-year numbers for March, Emory saw the total waste diverted from area landfills rise from 411.35 tons to 506.198 tons, increasing the campus diversion rate from 55.1 percent to 69.9 percent — a new all-time record, says Ciannat Howett, director of the Office of Sustainability Initiatives. Campus waste diversion rates also jumped in January over the same time last year, up to 68.1 percent over 60.9 percent, and held steady in February at 68.3 percent, the same as last year. 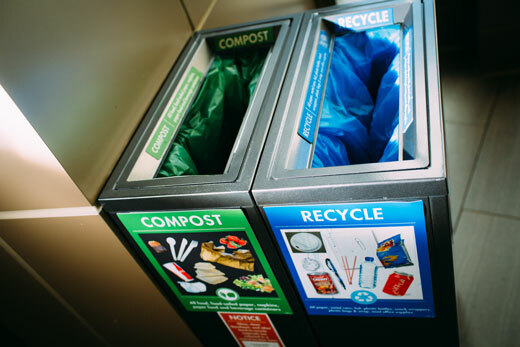 Matthew Early, vice president for Campus Services, notes that it’s been exciting to see the Emory community engage with recycling and sustainability practices that are already proving effective and attracting the interest of other institutions. “The numbers show us that the new policy not only outlines a path toward change, it’s making a difference,” he says. Howett credits much of the program’s early success to the participation of the Emory community, and hopes to see campus waste diversion practices only grow stronger moving forward. In January, faculty and staff were asked to begin collecting and self-sorting their own desk-side waste and deposit it into workplace recycling stations. Students already encouraged to recycle benefited from access to an expansion of standardized recycling bins across campus. Being vigilant about sorting recyclables and compostable items from the campus waste stream “is one simple task that takes just a few seconds to do, but has a tremendous impact,” she adds. Not only is less waste going into neighborhoods where landfills are located — often impacting low-income, minority populations — less noise, pollution and trash are drifting into those neighborhoods, Howett notes. In addition, many recycled and composted materials are being plugged back into the economy. Materials such as food waste and compostable food containers from Cox Hall are finding a new life as soil amendments that will be used by area farmers to grow food. Similarly, plastics and aluminum products are used by vendors eager to repurpose them into recyclable products, she says. In addition, diverting more waste helps the university avoid paying landfill “tipping fees” required to bury waste, Howett says. For Lacey Campbell, a rising junior in Emory College studying neuroscience and behavioral biology, the new waste policy has provided an empowering opportunity to help create change. “It’s truly amazing to see the transformations that are physically occurring on campus because of the new waste policy, but more importantly, the transformations in students,” she explains. Barbara Voss, a coordinator in the Office of Foundation Relations, views the new recycling program as both educational and exciting. “For some people there was some hesitation at first, because it was a change,” she acknowledges. Now, those changes are shaping new habits in the workplace and beyond. And Voss, who has always been interested in the environment, has come to see it as a small, hands-on way for one person to really make a difference. Sorting her own office waste takes only seconds. And she participates with the knowledge that her actions are helping to support the development of progressive new practices on a wider scale.